Below are Box Office Collection Report of bollywood film 'Simran' With his review, budget and total box office and worldwide collection status. Simran Savdhan movie lead star cast is Kangana Ranaut, Soham Shah. 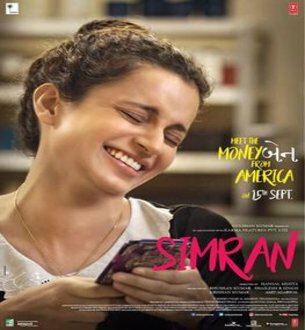 Simran is an indian Crime, Drama, Romance Film of 2017, directed by Hansal Mehta & produced by Bhushan Kumar, Krishan Kumar. Simran film Released in over 1500 screens in India. 'Simran' opened to a decent response with Rs 2.43 crore in its kitty followed by Rs 3.40 crore approx on Saturday and Rs 4.12 core in sunday. The total collection now stands at Rs 10.65 crore. Storyline:- Praful Patel (Kangana) is a 30-year-old divorcee living in Georgia with her middle-class parents. A housekeeper by profession, she gets drawn to a life of crime after her tryst with gambling at a Las Vegas casino. One bad turn leads to several more and before you know it, Praful is in a sordid mess.